Electrical hazards are a significant safety and financial risk for electrical workers and their employers. OSHA enforces electrical workplace safety standards outlined in NFPA 70E: Standard for Electrical Safety in the Workplace®. 1. Develop an Electrical Safe Work Practices policy. 2. Conduct an arc flash risk assessment and properly label the equipment. 3. Ensure electrical workers have adequate supplies of personal protective equipment (PPE) and insulated tools. 4. Provide regular safety training and employee assessments. 5. Perform regular maintenance on all electrical distribution system components. There are additional steps companies can take to reduce the potential for an arc flash. 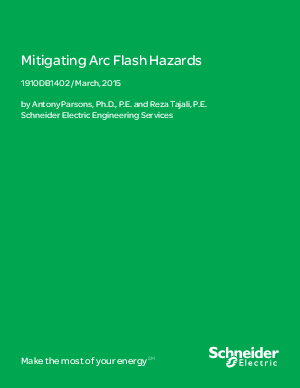 The white paper, “Mitigating Arc Flash Hazards” focuses on engineering controls to lower risks. Complete the form to for FREE download.